Lot of options and shortcut keys are available Microsoft Word, just we need to know and use in right place. 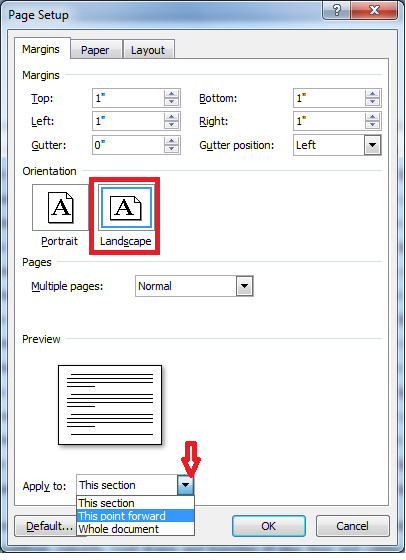 Working in Microsoft word is very easy but sometime it will irritate you if you don’t know basic option or shortcut key… So today’s topic is how to do Portrait and Landscape in Same MS Word Document… Just follow this method; it will work for all version of Microsoft Word like 2003, 2007, 2010 and 2013. 4) In "Orientation" Click on "Landscape"
5) In downside there is an option of "Apply to" Click and select "This point forward" and click on “Ok” your next page will be landscape. 6) If you want portrait keep your cursor end of page or text, then go to "page setup" click on "Portrait" "Apply to" Click and select "This point forward"